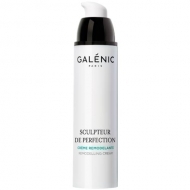 DESCRIPTION: Cell-Capital Soin Yeux Tenseur from Galénic is a fine and delicate eye-lifting cream with a feminine fragrance of iced tea, flowery, fruity and musky. Provides a more open and luminous look. It has as its main active ingredient Native argon cells, proprietary and patented plant stem cells, which combine with vegetable moisturizing glycerine, Argon oil enriched with vitamin E, which provides comfort, shea butter and tensile amino acid.